The Gallet F1XF fire-fighter helmet provides an unmatched level of comfort - this is one of thereasons for it to be mentioned. 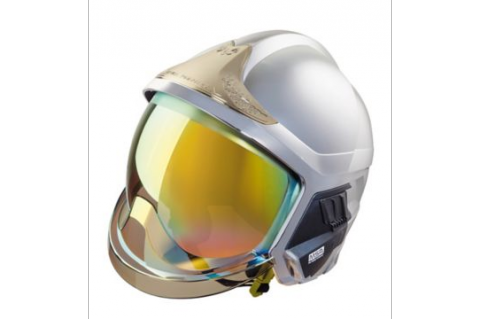 The Gallet F1XF helmet features a durable and robust construction and excellent protection against heat when fighting fires, not to mention comfortable fit for the user. Another solution presented by MSA is the alphaFP fall-protection harness. This can be used together with the air apparatus. The harness can be easily connected with the MSA apparatus' carrier plate. The expo visitors will also have the chance to see self-locking devices such as V Tec 1.8 PFL. These are the most compact and lightweight self-locking, energy-absorbing devices equipped with a spring ring. The alphaBELT multifunctional rescue and holding belt for emergency services is also worth your interest. It easily connects to the MSA breathing apparatus . Not only can the belt be used for limiting and positioning. It also provides a quick-access and safe seat to be used in emergency situations. This can be used for zip-line descent. The MSA offer includes the G1 mask - optimal tightness and high fitting comfort with minimal face pressure coupled with the SLS SingleLine SCOUT integrated monitoring device are the mask-features. The user's full monitoring elevates the SLS device to a new safety level of air-supply gear. All relevant information is easily accessible in the user's immediate view field. The trade-show visitors will be able to test the new, most advanced four-gas detector with built-in Bluetooth ALTAIR 4XR technology. It is the MSA most durable gas detector - it is resistant to a fall from the height of 7.5 meters, boasts the IP68 protection level and meets military standards (MIL-STD-810G). It comes with the 4-year warranty period. The ALTAIR 4XR device can also provide real-time information to the team members, supervisors, security managers and other persons. The International Fire Protection & Rescue Exhibition KIELCE IFRE-EXPO 2018 welcomes all visitors from 7 to 9 June. Come round to see the MSA expo stand (F55).